The new innovative Grade 100 chain lifting system! Sweden's Gunnebo Lifting has introduced their new GrabiQ system. 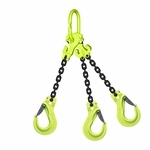 A new system of lifting based on grade 100 chain and a fewer number of powerful multi-function components. The result is a both simpler and safer system versus existing lifting systems. A four-leg sling with a shortening function, which previously required up to fifteen separate components, can now be handled with just three. Available in sizes ranging from 5/16” - 5/8" (8 - 16mm), the GrabiQ system offers improved safety, greater durability, and shorter assembly times.